Windows Reels Exclusive Slot Guide & Reviews - Casino Answers! Windows Reels is a 3-reel, 1-line fixed odds slot machine that you can play exclusively at Windows Casino. The symbols in Windows Reels mostly consist of fruits. The various fruits include cherries (a stable of slot machines), grapes, watermelons, lemons, oranges and plums. In addition to the fruits, there are also bell and dice symbols. Windows Reels is a fixed odds slot machine, which is much different from your traditional slot machine. Instead of winning on any winning combination, you can pick and choose which winning combinations you can bet on. To play Windows Reels, simply select which winning combinations you wish to bet on by using the “+” and “-” buttons on the paytable. The paytable will multiply your bet by the odds and display your possible win if you hit that winning combination. You can bet $0.10 on each winning combination, so the minimum bet is $0.10 and the maximum bet is $1. If you wish to change all of your bets, you can hit the “Clear Bets” button. To spin the reels, hit the “Spin” button. Payouts on the Windows Reel fixed odds slot machine are as follows 1 Cherry symbol (2X), 2 Cherry symbols (5X), 3 Bell symbols (10X), 3 Grape symbols (15X), 3 Watermelon symbols (20X), 3 Lemon symbols (25X), 3 Orange symbols (30X), 3 Plum symbols (50X), 3 Cherry symbols (75X) and 3 Dice symbols (100X). There ar e10 winning combinations total in Windows Reels. The top jackpot on the Windows Reels slot machine is 100X (or $10). You can win this by lining up 3 Dice symbols on the single center payline. On Windows Reels, every spin is a winner. You don’t have to worry about blanks coming up. You’ll at least win something on every spin you make in this game. 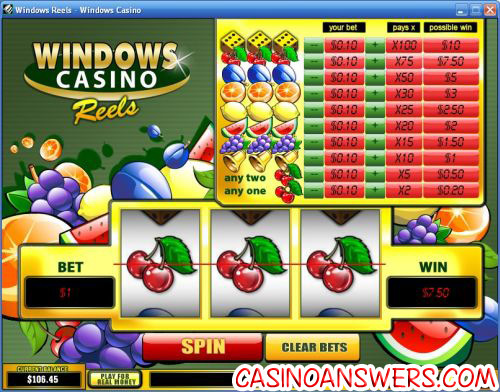 Windows Reels is found exclusively at Windows Casino. You can get a $250 signup bonus – 100% up to $125 on your first deposit and 250% up to $125 on your second deposit – to play Windows Reels. Sign up and make your deposit now at Windows Casino! How come I can only play Windows Reels at Windows Casino? While you can find a “skin” of this game at virtually every Playtech online casino, Windows Reels is the Windows Casino brand version of this slot machine. Are USA players able to play the Windows Reels slot machine? Unfortunately, Windows Casino is not taking players from the United States. For a huge selection of US-friendly slot machines, please visit Super Slots Casino. What exclusive casino slot games are there?